NF When I’m not in Maine, which is much of the year, and I imagine what it would be like to escape from whatever’s preoccupying me at the moment, a picture comes into my mind and this is the closest approximation (and it is only an approximation) of that. GB So you’re in Harvard for most of the year? NF Yes I’m usually in Cambridge, Massachusetts, but with movements, for example I was in Tunisia four times in the last year. I often notice that when one is in a place, including a very interesting or beautiful place, one often has a momentary urge to be in another very different place. I think it has something to do with geographic beauty. You can appreciate that what’s in front of you is extraordinary and extremely beautiful but sometimes you can be in the most different place you could be and the beauty of somewhere else comes clearly into your mind. It’s almost sharper and more clear when you’re not in the place than when you are. GB Would you say that this is universal beauty? Would anyone find this place beautiful? NF Yes, there’s something about the juxtaposition of the water of the bay, the stones, the green of the trees, the seals that can’t quite be seen in this picture. I think almost anyone seeing it would say it’s a beautiful landscape. GB Does the history of the area contribute to its beauty? NF Almost nobody knows the history of the area and if one did it would probably detract from its beauty. The 17th and 18th centuries saw violence in Maine that is essentially wholly forgotten both by the people who live here and by the many people who visit. Similarly there are two enormous shell middens nearby left by American Indians who lived in this spot for a very long time. It’s not common for people to think that if it weren’t for the killing by war and illness of the American Indians that they wouldn’t be here enjoying it. GB So for you this place is an escape? NF Not so much escape as reflection. I suppose escape and reflection are connected but escape implies a certain desire to turn off the mind and for me the idea is that the beauty releases a certain capacity to think about other things. That of course is possible anywhere but is somehow enhanced by the experience of encountering this. GB So unlike Alex Ross, who felt the dark side of his landscape contributed to its beauty, that’s not true for you? NF Well the dark side of Maine, a bit like the UK, is the dark and the rain. But I don’t associate it with a dark side in the way you might California – or Kalifornia. Maine has the capacity to be a banal tourist escape and people who’ve studied the history of Maine talk about the invention of Maine as a tourist location. I suppose the cultural transformation has been more successful than California. GB It’s a very simple scene you’ve chosen that doesn’t appear to be transformed by mankind. NF You say this seems to be without cultural reference but one thing we’ve learned from people who spend all their time thinking about landscape and its construction is that it isn’t that way at all. Just the word, “Maine,” has this tremendous cultural power and resonance at least within the United States that carries with it a lot of specificity. I pointed the camera in one direction but in the opposite direction you can see a house. It might look as though there is nobody around for miles when in fact there are people. I remember reading about how videographers make films about nature in Africa where they show you the Serengeti and they’ve edited out all the signs of human civilization that keep coming into the lens. Here it didn’t take a tremendous amount of effort but it was a conscious choice. GB How do most Americans think of Maine, culturally? 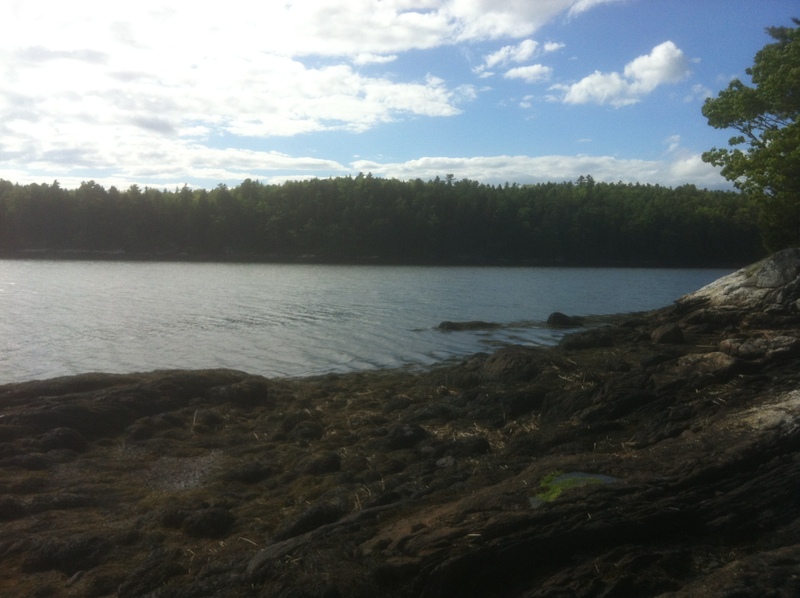 NF Maine has successfully marketed itself through self-conscious effort, as cool when everything else is hot, as simple when everything else is complicated, as natural when everything else is built up and overgrown. The reality of course is much more complicated. The trees that you can see here are not ancient trees. In fact 100 years ago everything you see here was stripped of trees to become farmland and when the farms weren’t economically viable they let the trees grow back. Maine is now full of pine forests because the old hardwood forests were all cut down for wood to use as masts and land to use for farming. GB So it is a very man-made landscape. NF It’s natural in the sense that these are the trees that grow quickly when you abandon a farm. But that’s not how Americans have been taught to imagine Maine. GB Do you think there’s always a political background to an ideal of beauty? NF Once human beings are involved in the shaping of an environment, I believe man is a political animal and I don’t think there’s a way to avoid that feature of our being. We don’t quite make these spaces but we shape them. At the same time we have a recurrent fantasy of taking things out of the sphere of the political and part of beauty is exactly that aspiration not to think about the politics behind something. GB Do you think the way we form our ideals of beauty have been changed by the speed at which we receive information from around the world? NF I would like to think not, that there are primal elements in our response to beauty. I would like to think there’s something to do with the creation of awe that has to do with our response to beauty. That’s a romantic ideal but I think there’s something to it. Green trees are beautiful for their life-giving properties more than the fact that we’re conditioned to think of them as beautiful. NF It’s a combination of the formal property that would be recognized by others and some internal experience that moves you out of the ordinary. It could even be that you’re seeing something tremendously ordinary but there’s something about the way or the moment or the state of mind in which you’ve seen it that transforms it into having the capacity for beauty. That’s a clue for me that it has to do with how it stimulates one’s feelings and thoughts.